After I graduated college I thought I knew where I was headed, or at least the general direction. I imagined the next step would be to find a full-time job. Never did I see myself becoming a freelancer. Although the more I read, freelance has become a common route for those of us in technology driven fields. Freelancers take many forms such as graphic designers to social media marketers. More companies have begun to seek out individuals with specific areas of expertise on a project basis. People tend to assume freelancers have it made being able to work from home with flexible hours. While I'll admit there are some nice perks, like being able to work in your pajamas, it has also taught me some very valuable lessons. Hold yourself accountable. It’s important to treat it like you would any other job. This was something I struggled with right off the bat. Since I work from home I somehow find ways to occupy my time with everything but the tasks I need to get done. If I don't schedule out my day the night before I’m completely scatterbrained in the morning. I'll jump all over the place trying to do different tasks — I always write down what I need to get done a day in advance. It's crucial to let your mind rest. If I feel like I've been staring at my computer screen for too long I make an effort to move around. Sometimes I take my dog for a walk or dance around the kitchen while baking cookies -- both activities I find help relieve stress. Find whatever give you some relief, such as running, yoga, knitting, anything that floats your boat. I like to give myself mental deadlines. Even though a projects might be ongoing, I give myself until a set time in the morning to get the task done. This might not work for everyone but it works me, mostly because in school I always felt like I worked best under pressure. I get a little giddy with when a new client reaches out. But it’s also important to recognize when your taking on too many clients. I want to help others with their vision but I have to step back and see if I can commit enough time to do quality work. A task that only takes five minutes to complete is the best place to start in my opinion. Once I send that email that’s been nagging me all morning I start to get into more of a productive mode. The articles I read on how to be productive always say to ‘start with the hardest task first’ and I agree to an extent. But sometimes after I get those small tasks done it helps me feel more prepared to tackle bigger tasks on my list. Even though I’ve only had a handful of clients. I’ve learned that each client will communicate what they want differently. While you do have some creative control at the end of the day, it’s their brand and what they say goes. Make sure to deliver a quality product that fits their needs. Trust me I know how easy it is to get caught up in a project. That’s why I make a point to check my emails periodically throughout the day. While I might not have set hours, I like to keep the same nine to five timeframe when it comes to sending and receiving emails. This level of professionalism keeps up credibility. This one should be a no brainer. 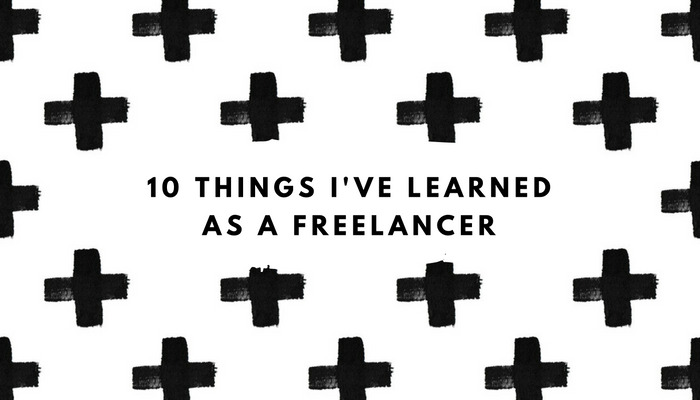 When it comes to freelancing you’re running your own business. Make sure to keep it organized. I create spreadsheets to help me stay on track. It’s important to document when you send out invoices and receive payments. I’ll be the first to admit, I need to get better at saving receipts. Comes tax season you’ll want to document everything you’ve purchased over the year and make sure to write certain business expenses off. In my case for example, I would write off a design class I took over the summer, my monthly subscription to Adobe, and train tickets for weekly meetings in the city. Thinking about becoming a freelancer? Let me know if you found this post helpful in some way, shape or form!